What? Um yeah, I thought that I would move away from all my food posts today and give you a little peek into my toddler’s world. First, there’s Stump. 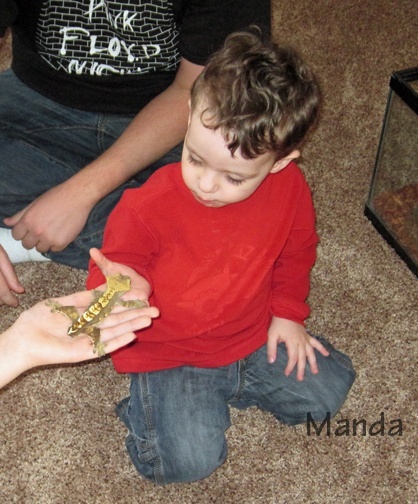 He’s a… a… lizard? Gecko? Oh, I’m so bad at the whole animal name thing. He belongs to my sister-in-law but he’s been living at my mother-in-law’s (Geema’s) house. My kids love to play with Stump. To the surprise of many, I even held him for a short while. Here he is. Then there’s Eeechy Birds (or Icky Birds or the real name Angry Birds). Baby E is obsessed with them. G is quite a fan too. 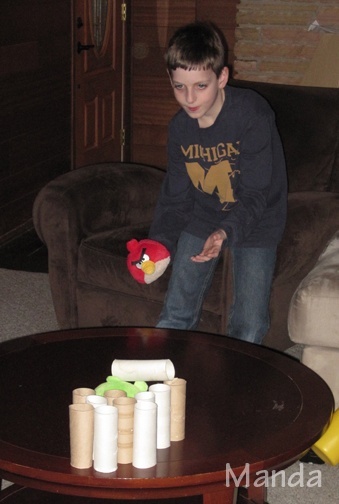 In fact, Baby E gave G 2 Angry Birds for Christmas. 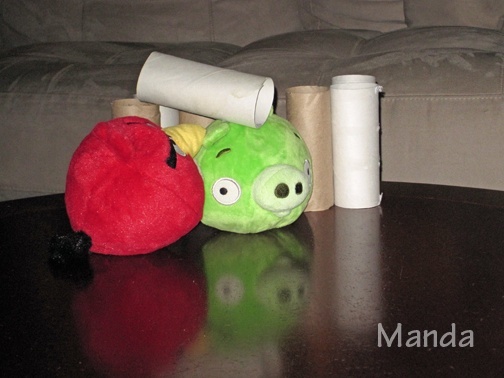 They have found ways to play without being in front of the computer (or cell phone or Kindle Fire). 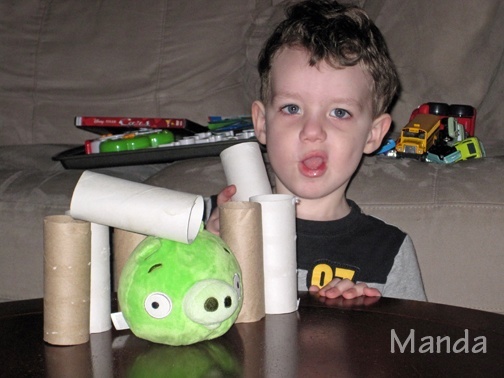 G has recycled toilet paper tubes and uses them to build walls around the pig. Then, they take turns tossing the bird at the pig. Serious hours of fun. I have no idea what he’s saying. LOL! Oh Bad Babies, Why Can’t You Be Good? I’m Late for the Ultimate Blog Party! Friday Date Night! And… He doesn’t even know my real name!